Pawsitive Impressions: A Lasting First Impression in Fishers, IN! You get one chance to make a pawsitive first impression! We loved this note from a neighbor in Fishers, IN who was impressed by the NEIGHBORLY service provided (even before the pet center officially opened)! Thank you so much for opening a store in Fishers, Indiana! My husband and I have been loyal customers of the Noblesville, Indiana store for a long time, but we live in Fishers. 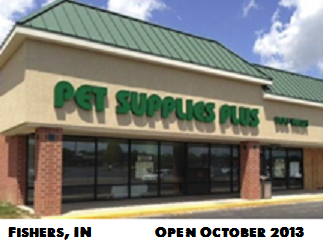 When I saw the Pet Supplies Plus store sign appear on a building very near our own neighborhood, I was really excited, and my husband was glad to learn you were coming to our home town, too. I was so eager to be a customer. I came to the store yesterday, thinking it was already open for business. A friendly man was standing outside in front, and told me I was ONE DAY too early! He actually offered to sell me something if I had an urgent need, which I didn’t. He went inside and brought me out one of your ad papers. Today I went back with a coupon in hand from the ad paper, and I was helped by a very friendly and courteous young man. He carried my big dog food bag out to my car for me, which was great! I’m 57 years old, and I appreciated his offer of help! So thanks again! I really hope the new, Fishers, IN store does a booming business!! !